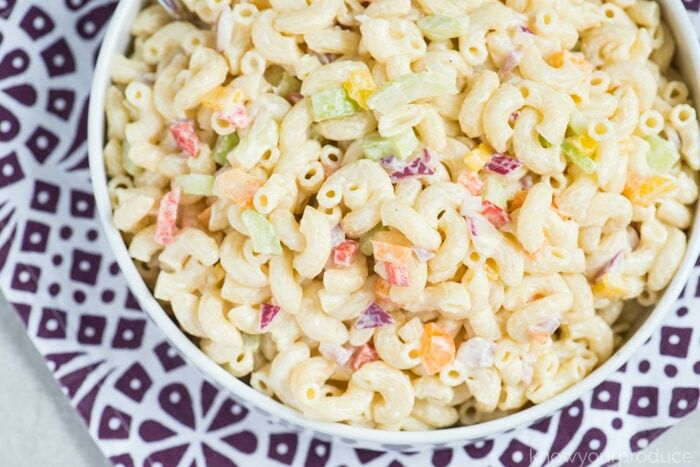 Easy Macaroni Salad Recipe for potlucks and parties. 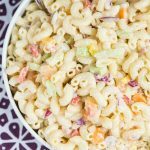 This is a vegan macaroni salad that tastes just as good as the old fashion pasta salad recipes, but it’s plant-based! 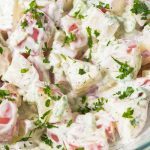 Macaroni salad is a classic side dish for parties and holidays. 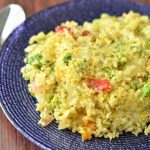 Add a scoop of this vegan side dish to your plate and you would never know that it is vegan! This recipe is best made in advance so the flavors can develop for a few hours. It’s an affordable salad that everyone loves. Start by boiling the pasta. While the pasta is boiling you can take this time to prep the veggies. You can chop the veggies up as small or as big as you like. Just try to ensure they’re all the same size so someone isn’t getting a huge bite of onion or a huge bite of pepper out of nowhere. Drain and rinse the pasta with cold water once its fully cooked and place into a large bowl. Add in the peppers, onions, celery, mayo, mustard, mayo, vinegar, and salt and pepper. 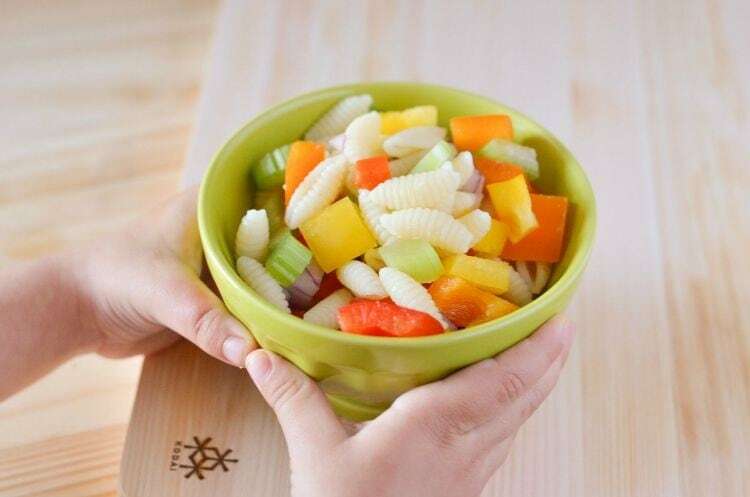 Toss to combine and allow the pasta salad to sit in the fridge to chill before serving. 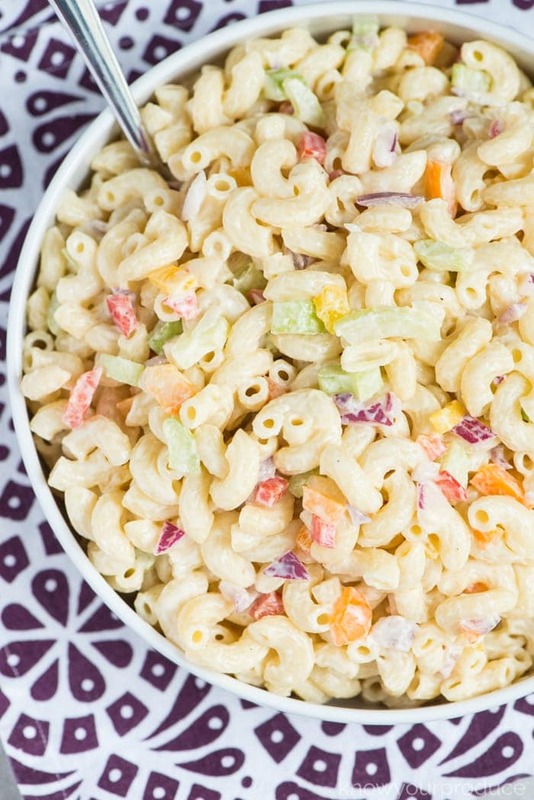 Can you make this Easy Macaroni Salad ahead of time? Absolutely, and we recommend it too! 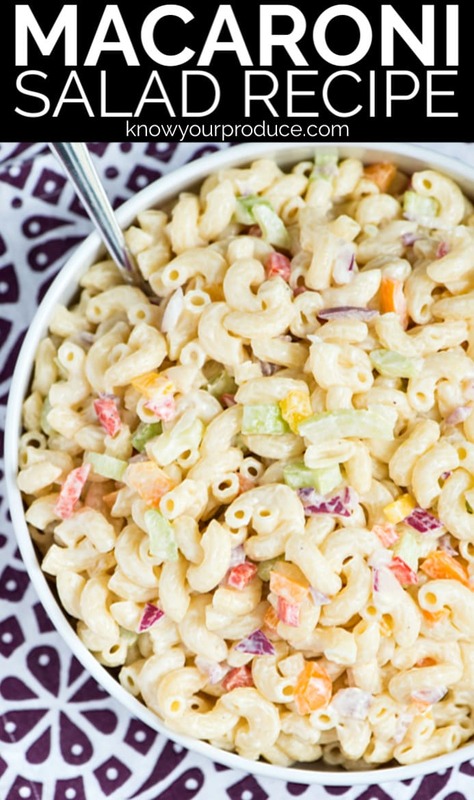 You can serve this pasta salad at room temperature, but macaroni salad is best enjoyed cold. 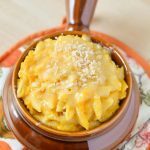 That’s what makes this an easy macaroni salad, you can prep it in advance and have it ready when needed. What’s the best vegan mayo? We recommend Just Mayo or Hellmann’s. Both make a delicious vegan mayonnaise that even those who aren’t vegan enjoy. 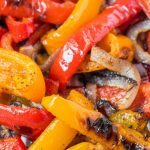 This recipe is full of color, but we did leave out the green pepper. You can also add in green pepper if you’d like, but just remember that green peppers are a bit more bitter than colored peppers as they are picked before they can ripen into orange, yellow, or red. 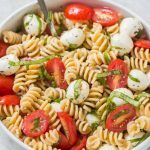 Use any small pasta you like, from shells, elbows, even rotini makes for a great macaroni salad. If you want more color you can add in fresh herbs. We use white vinegar in this recipe, but you can use apple cider vinegar as well, just know that it is stronger. Another great option is freshly squeezed lemon juice. Cook the pasta until it’s al-dente. You don’t want a mushy pasta. About 7-8 minutes in boiling water should be good. 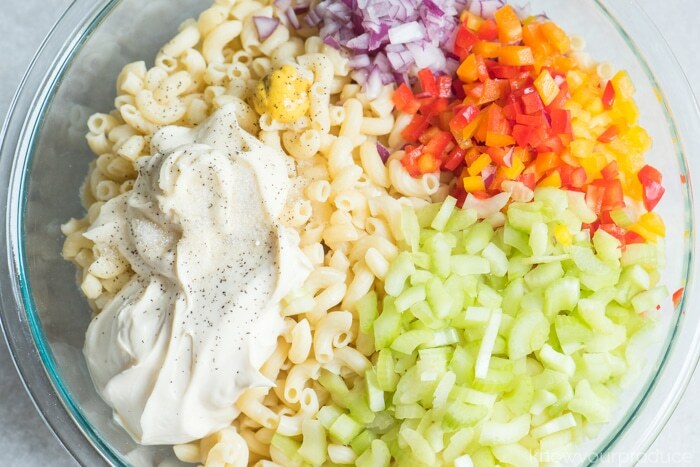 Super Easy Macaroni Salad Recipe. 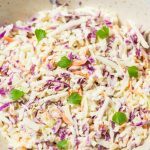 This is a vegan macaroni salad that tastes just as good as the old fashion macaroni salad recipes, but it's plant-based! In a large pot cook the macaroni. While the macaroni is cooking chop the celery, peppers, and onions. Drain the pasta when fully cooked, rinse and place pasta into a large bowl. Add the cut vegetables, mayo, vinegar, mustard, sugar, and salt and pepper to taste. Mix the macaroni salad, cover and refrigerate. Serve the macaroni salad cold. 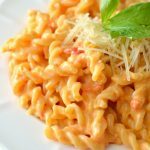 Like all pasta salads, this macaroni salad is best when made a few hours in advance so the flavors can fully develop. I have been on the hunt for a new cutting board that will last me a while. I love the simple but beautiful look of these cutting boards! 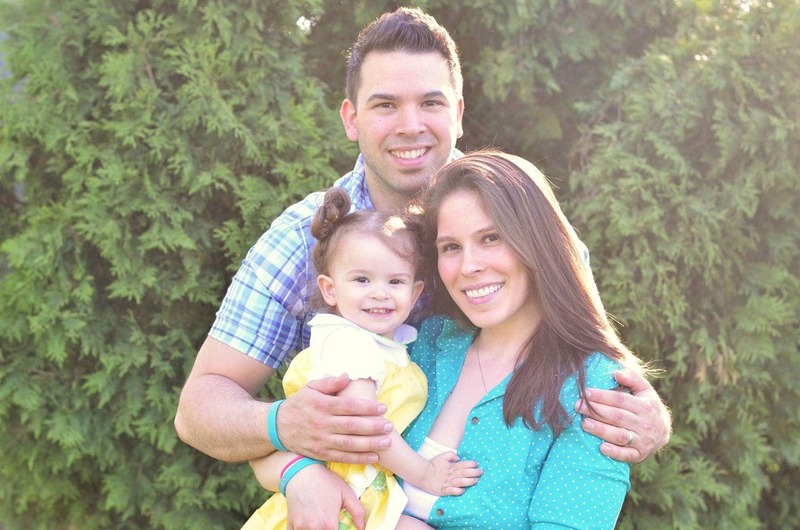 Thank you for sharing this macaroni salad. I love how simple it is to make! YUM! Oh how I love a good pasta salad!! This looks amazing! 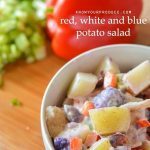 The pasta salad looks yummy – love all the colors!